Flexible and intuitive - the Pro is one of the most creative and inspiring controllers we've tried. Welcome new modes. Easy to use. Not as powerful as Push. Like many Live users, I snapped up a first generation Launchpad back when they were originally released in 2009. I must admit, however, that my Launchpad has been sat in storage for over a year now. This isn't a reflection of the quality of the hardware itself; in fact, despite plenty of rough treatment, it's held up admirably and functions just as well as it ever did. However, the Live controller market is now a far more competitive place than it was six years ago. At the top end, Ableton's own controller, Push, provides more flexible and intuitive control than its rivals; while the budget/compact sphere is sewn up by Novation's own 'mini' offerings, along with Akai's APC Mini equivalents. Meanwhile, iPad owners have the option of flexible, affordable apps like touchAble, Conductr or Lemur. By contrast, the Launchpad's simplistic grid of 64 on/off buttons now feels fairly limited in scope. Enter the Launchpad Pro - Novation's latest Live controller, which retains the straightforward, compact form factor of the original, but boasts a deeper and far more flexible feature set. As with the original, the Pro is focused around a grid of 64 backlit square buttons, which here are surrounded by a total of 32 backlit circular 'mode' buttons. The hardware itself is marginally bigger and noticeably heavier than its predecessor, but it's still very much a portable controller. Build quality seems impressive too - the combination of metal chassis with rubberised outer coating means that the Launchpad Pro is plenty sturdy and feels like it could happily take a regular beating on stage. The RGB buttons look very striking too, and provide clear visual feedback under all lighting conditions. "It's brilliant for live performance. We can see it becoming a centrepiece to a lot of musicians' stage set-ups." The increased number of 'mode' buttons handle navigation around the Pro's deeper functionality. As with the standard Launchpad, the eight buttons to the right side are used for launching scenes in Live's Session view. Along the top, the four arrow buttons - used for navigation around Live's interface - and User and Session view selectors remain, but here they're joined by buttons for entering Note and Device modes, allowing users to play instruments and tweak Live's devices respectively. In Note mode, depending on whether an instrument or Drum Rack is selected, the central grid will light up to display either a 4x4 drum grid (in the lower left) or chromatic scale rising from left to right in semitones. By default the scale begins at C1 with tonic notes lit in pink and diatonic notes in white (although all notes are playable, whether lit or not). This scale can be transposed using the arrow buttons, and can go as low as C2 and as high as G8. As with the original, Session mode turns the pads into a hardware representation of Live's clip launcher, while User is effectively a blank slate to be mapped. Device mode, meanwhile, offers control over Live's various effects and utilities. The eight mode buttons to the left handle a variety of Live's edit functions: Record, Double, Duplicate, Quantise, Delete, Undo and Click on/off. There's also a shift button used to access a few deeper functions, but you'll find yourself using this mercifully infrequently. Finally, the bottom row replaces the original's Mix mode by giving direct access to Track Arm, Track Select, Mute, Solo, Volume, Pan, Sends and Stop Clip. Pressing any of these buttons will switch the main grid to control the relevant mixer function, in most cases turning the grid's columns of buttons into faux 'faders'. Most significantly of all, the central buttons are now velocity sensitive and feature polyphonic aftertouch. The difference this makes to playing drums and instruments is huge. While the original could be 'played', its simple on/off nature lacked any real sense of musicality. The Pro is far more expressive. The buttons themselves can feel a little 'rigid' at first, but velocity sensitivity and aftertouch settings can be tweaked as necessary, and with practice the Launchpad begins to feel like an interesting and inspiring alternative way to play your instruments, in much the same way as Push. In a nice little touch, velocity also controls how quickly parameter changes are made in the various Mixer and Device modes - gently touching a point on the 'fader' will result in a slow fade between settings, while a harder hit results in a more abrupt change. A similarly well-implemented feature is the dual 'momentary' and 'latch' modes used for navigating around the mixer and settings. This allows users to permanently switch to a new mode by briefly pressing the corresponding button, or jump to it temporarily by pressing and holding. Finally, the Pro's icing on the cake is its MIDI capabilities. It features MIDI In/ Out ports - via 3.5mm jack sockets with supplied adaptors - allowing it to act as an interface for Live. It also functions standalone though, meaning it can be used to play/ control any MIDI equipped hardware without the need for a computer. 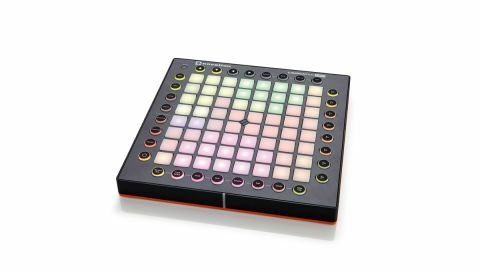 The Launchpad Pro isn't the be all and end all of Live controllers, but what it does, it does very well. It's not suited to precise mixing but it's intuitive and inspiring for creative purposes - allowing users to fluidly compose without being drawn away in order to jump between views or devices. It's brilliantly suited to live performance too, and we can see it becoming a centrepiece to a lot of musicians' stage set-ups. It's not as powerful as Push, but being more portable and cheaper it doesn't need to be. Its standalone MIDI capabilities give it a distinct edge too. In all, for the price, the Pro is one of the best controllers on the market.